Everyone likes to be considered a unique individual. No One likes to be “put in a box”. That’s true unless they’re talking about playing casino games at Box 24 Online Casino. At Box 24 everyone is a VIP. And note the variety of no-deposit bonus codes – always a real treat! 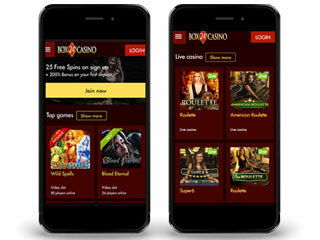 Read on to get all the scoop in this Box 24 Casino Review. The Box 24 online casino was introduced way back in 2000, a lifetime in online casino years. Many other casinos that were founded around the same time have kept on many, even a majority, of the games they started out with. Some call it nostalgia. Box 24 continues to refresh its library of games. So don’t be fooled by a casino with 600 games extolling its own greatness when compared to a casino like Box 24 with “only” about 150 games. We might say that taken as a whole, the 150 games at Box 24 are more fun to play than the 600 games at a different casino! Box 245 is a proud member of the Deckmedia group of online casinos. The casino is registered, certified, and regulated according to the bylaws of Curacao. One of the big things that stand out regarding Deckmedia casinos is that they should be taken as a whole. While no single one of the group’s casinos can carry games from all the best providers, management has seen fit to feature games from one provider on one casino and from another provider on another casino. Box 24 has games from no less than three developers: VIG, Octopus Gaming, and Betsoft. The notion that all Deckmedia’s casinos should be seen as indispensable parts of a larger enterprise, points to two main aspects of the group’s corporate philosophy. First, they keep each casino relatively small to facilitate easy downloads. But, more importantly, they feature the best graphics software for their instant play platform. Box 24, like all Deckmedia casinos has the finest instant play platform available so you can easily play at all their casinos, sampling games from the many providers they use! The casino has an excellent mobile gaming platform. Among the online casinos that have had mobile for some years already, mobile once was the inferior step-child of the parent desktop casino. That is no longer the case! At Box 24, mobile gaming is far more than a craze. The mobile platform is now the default gaming platform of a growing number of players choosing to play on their phones and tablets. Thus, Bet 24 makes sure that its mobile casino has every modern technological advancement as soon as those advancements become available. The casino also has a Live Dealer studio where you can play blackjack, baccarat, roulette, and Super 6. The Live Dealer provides some much needed live action without the inconvenience of travelling to a land-based casino. Box 24 runs numerous promotions, tournaments, and especially takes care of their VIPs. 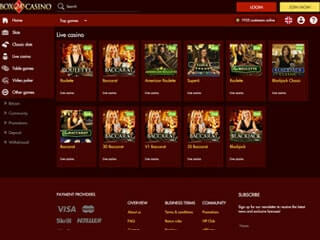 The casino runs a collection of some 150 games from three providers. Each game features the finest graphics and animation. You feel as if you are one with the story if you’re playing slots, or one with the action if you’re playing table games. Slots lead the game parade at Box 24. There are great features in the overall slots library. These include Wild and Scatter symbols, dynamic bonus rounds, and all the other features of video slots. Each slot tells an exciting story. One aspect of playing the best slots from numerous developers is that the slots can run the gamut from deadly serious adventure or danger to the most humorous, tongue in cheek story imaginable. The selection of table games is sufficient to satisfy the blackjack, roulette, or craps needs of any gamer. This is not a casino that boasts of 50 or more variation of blackjack with rules confusing enough that players have to earn advanced degrees to play them all! Box 24 offers the most graphically and visually attractive table games with enough variation to suit any gamer. The casino also has a sizable library of video poker. This type of poker pays the highest return per dollar wagered of any game and you can actually turn the tables on the house by using a strategy card. Finally, when you need a break from slots, table games, or video poker, you can play bingo or scratch cards. To get you going at Box 24 Casino, there are several no-deposit bonus codes offered for you to choose from. Start with the one which appeals to you most, and then move on to get all the bonuses you can. In addition, the casino runs promotions every day of the week – be sure to check in often, in order to take full advantage of all the bonus codes offered. The creative minds at Deckmedia have devised ways to attract you to their casinos every day. In addition to cash bonuses, the casino runs many tournaments. You can read about them on the front page under “promotions”. The prize money for each tournament is guaranteed so all you need think about is the competitive fun they offer. And tournaments repeat so even if you came in second this time, there’s always next time! The casino runs a comp points program but they have a unique name for it: the VIP Club. Yes, every player at Box 24 is a VIP form the first bet they make. There are six tiers in the VIP Club. When your points reach a certain level, you are given a personal account manager whose sole job is to keep you happy. This they do by giving you gifts chosen just for you or a family member, trips, tickets, cruises, or any other great gift you and your manager can think of together! Box 24 considers the safety of your money to be its very highest priority. To that end, they employ the finest SSL encryption software. If a hacker can’t get into a commercial bank, they can’t get into Box 24 because the casino uses the same software! You can reach the customer service office 24/7/365 by way of email, chat, or telephone. The reps are well-trained to either answer any question you have or to find the answer if your question stumps them. In this Box 24 Casino Review we touched upon the many fine aspects of gaming at Box 24. The proof is in the pudding, as the saying goes, and to taste the pudding you have to open the box! So try out Box 24 Casino now and see if it doesn’t tickle your taste buds.